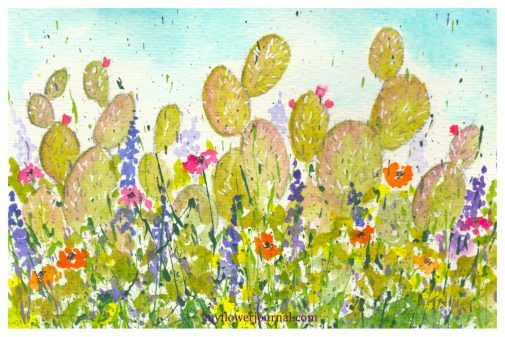 My inspiration to paint desert cactus and splattered paint flower art cards came from a recent trip to Arizona to visit our daughter and her family. The March weather was beautiful so we spent most of our time outdoors. 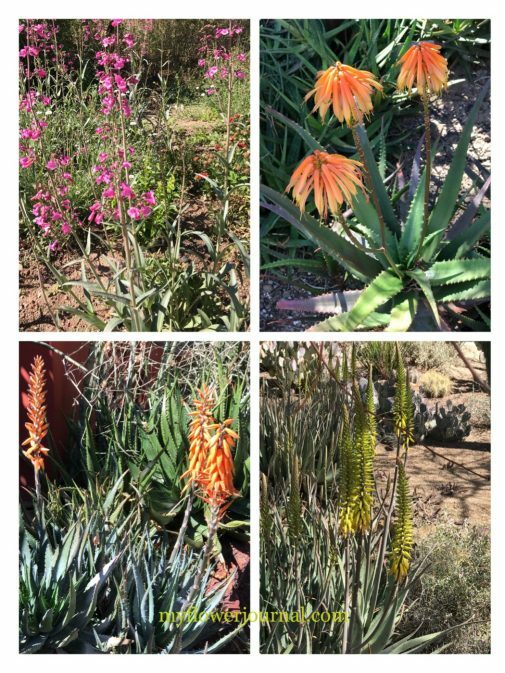 Every where we went there were cactus and succulents. Some were starting to bloom. 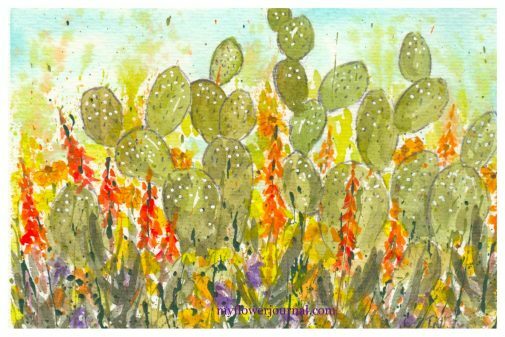 After spending the morning at the Desert Botanical Garden I couldn’t wait to get my paints out and try adding cactus to some splattered paint cards I brought with me. When I travel I like to bring a little on the go paint kit with me. I usually include some watercolor postcards that already have acrylic paint splattered on them. It makes a nice easy on the go project. I like to splatter a lot of cards at the same time so I have some ready for travel or times I feel like painting, but don’t want to splatter. I splatter paint on a variety of sizes: 6×6, 4×6 or 5×7 or even scraps I can use for gift cards. This time the cards I used were 5×7 inches. *If you aren’t familiar with how I splatter acrylic paint and turn it into flower art go here. You will find a video and lots of FAQ and helpful info. 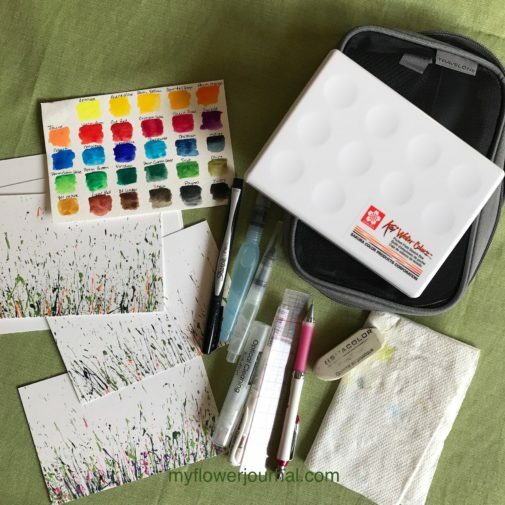 Sakura Koi Watercolor Field Kit and the brush that comes with it, 5×7 watercolor paper, , white paint marker, mechanical pencil, eraser, paper towel. 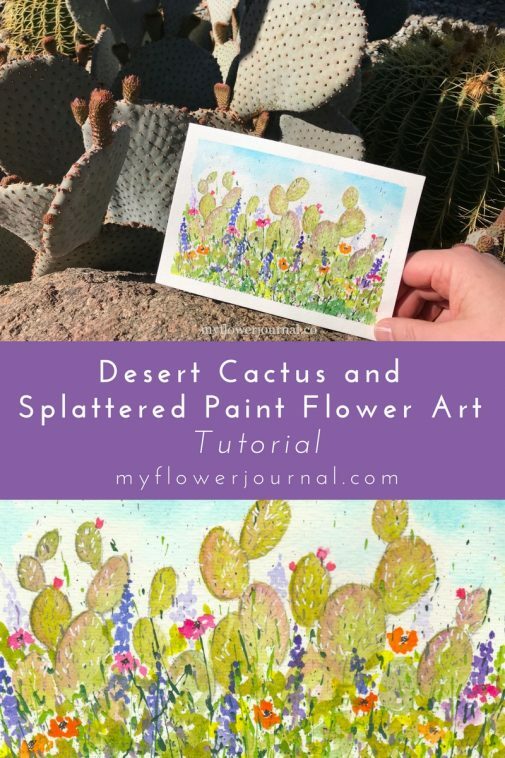 Steps To Add Desert Cactus and Splattered Paint Flower art. 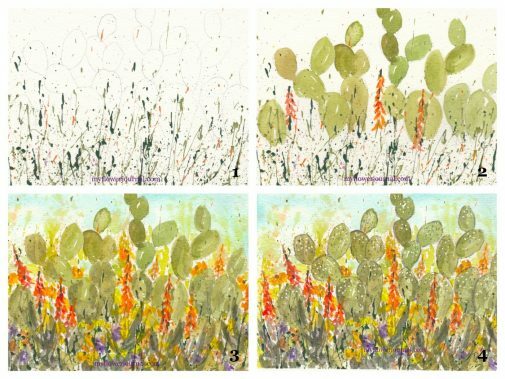 Add a light pencil sketch of cactus on your watercolor paper that has been splattered wth acrylic paint. Make sure the acrylic paint has had a chance to dry. You can use the photos I have included below as reference. Paint the cactus using a variety of greens. Start to add the flowers. Keep adding more flowers and foliage. Darken some of the cactus pads as needed to give variety. Add sky color and a few watercolor splatters while the sky is damp. When the watercolor is dry use your mechanical pencil to outline a few of the cactus and add some texture to them. Last of all use a white paint pen or white gel pen to add a few dots or needles to the cactus. Finished 5×7 Desert Cactus and Splattered Paint Flower Art. 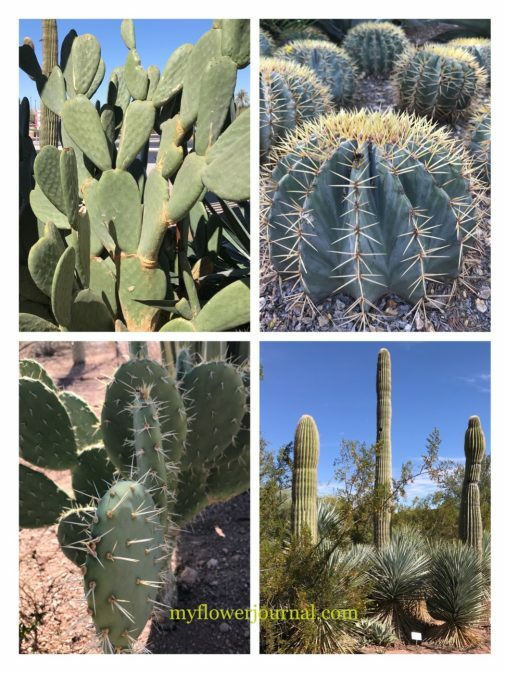 Here are some photos I took at the Desert Botanical Garden in Phoenix AZ. 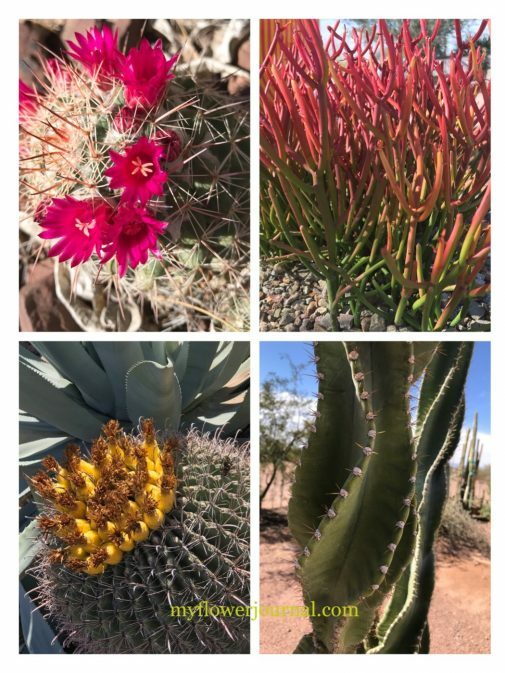 You can use them for inspiration as you paint your own Desert Cactus and Splattered Paint Flower Art. I bought this book, Guess Who’s In The Desert, while we were at the Desert Botanical Gardens. 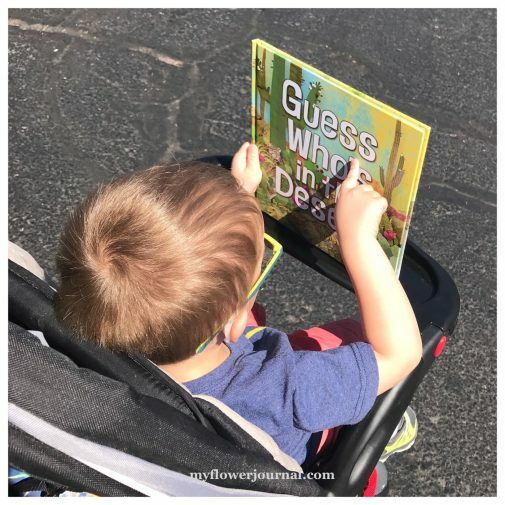 I love the illustrations and my grandkids like reading the clues and guessing which animal will be on the next page. Fun book! Need help drawing cactus and flowers? 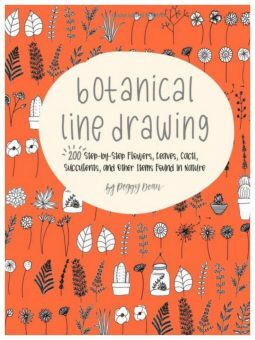 I really like this book from Peggy Dean: Botanical Line Drawing. This post contains affiliate links for the products I used to create this art. Those are beautiful! I love that you paint where you have been.